What if you could change the story of Just One child? 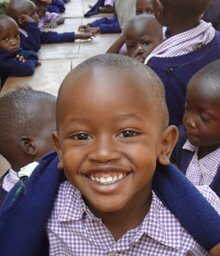 When you sign up to become a sponsor, your support will go to a child who has been identified as not having access to education, therefore giving them the awesome privilege and opportunity to have a more secure and healthy future. I think we can agree that education is such an important tool as it provides the necessary keys for more thoughtful, forward-thinking decisions. These important decisions will absolutely affect their future in significant ways, setting them up with the skills sets and knowledge of bringing change back into their communities and beyond. Would you like to help more than one child? Education has long been recognized as one of the key contributors to eliminating poverty. However, education comes with a separate host of problems, which varies depending on geographic location. In America, access to education is something we overlook on a daily basis. Simply, if you want to attend school you can. This is not the case for the rural villages of Kenya. 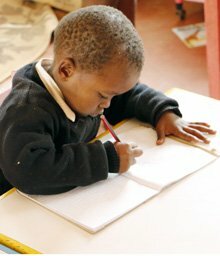 According to the UNICEF , only 36% of children attend secondary school (high school) in Sub-Saharan Africa, which includes Kenya. As this statistic shows, there is still a serious issue regarding access to quality education in Kenya. You can help change that, and thus, change the story of just one child. Notes/pictures from the student you sponsor when our Just One Africa team is on the ground doing our own follow-up. THANK YOU for partnering with us to extend grace and offer hope and love to these beautiful children. Their future is brighter because of YOU! 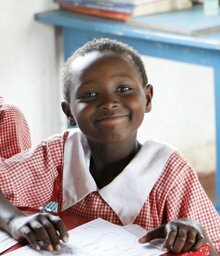 Education provides a hope for a better future. Creative classrooms provide a healthy environment to learn. When children enjoy their education, they learn so much more. 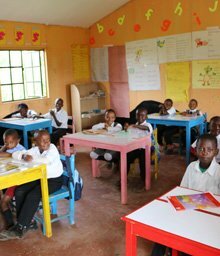 Education is not free in Kenya, so these children take learning very seriously.